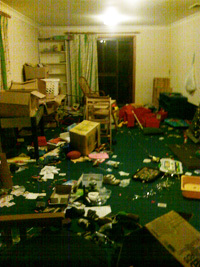 Why You Should Never Leave A 3-Year Old Unsupervised - The Lazy HouseHusband - Reflections Of A Stay-At-Home Dad! I look after Destructo, my youngest son, during the day while my wife goes to work. He is three years old. I am also trying to build a business from home, so most of the time, while I am working, Destructo stays here cooped up in the office with me. Generally, he will sit on the carpet here next to me and spend hours quietly making all of his toys function together in a seamless child’s universe where logic has no place and no contradictions ever exist. In his world, dinosaurs drive little cars on wooden train tracks and live in Lego cities, where they must fight robots, bad guys and every other “made in China” plastic toy so that everyone can become good friends in the end and obey their leader, who, of course, is my son Destructo. Since Destructo is still in nappies, he doesn’t really have to leave my office at all, except to eat and go pick up his brothers from school in the afternoon. When things get pretty stinky in the office, it’s time for us both to take a little break and go have a snack or get some fresh air in the backyard or the porch just outside the kitchen. Occasionally, however, Destructo realizes that a central character is missing in his stories. Usually it’s Bambi the dog (a stuffed deer), or Casey the dog, or Wappy the dog, or Skunky the skunk. He will then ask me if he can go fetch his friend and I’ll generally signal that it’s okay for him to leave the room. This is exactly what Destructo has been plotting, scheming and waiting for all along. 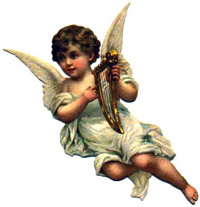 He knows that if he acts like a little angel and plays nicely and quietly with his toys, after a certain time my guard will be down and I’ll be so fully engrossed in my work that I would nod “yes” to anything he asks. Which is exactly what happened! By the time I realized Destructo had been gone out of my sight for several minutes and things had become strangely quiet in the house, the damage had already been done. 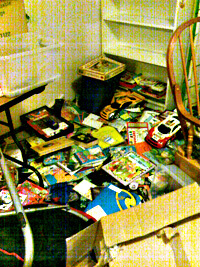 As you can see, Destructo managed to empty out every single box and container onto the playroom floor, with devastating and quiet efficiency. How can he create so much destruction without making any sound? You have to admit, the kid did a thorough job of leaving no storage box unturned. 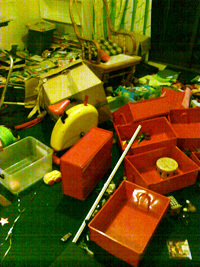 After seeing what a three-year old force of nature can do to the downstairs playroom when left alone for a few minutes, I think it may be time for me to let go of the dream of living in a neat and orderly household. That is some serious work there! Hmmm…As a retired house-husband (both my lads have now graduated) I would suggest that the most practical solution to the problem of having to leave a toddler alone in the drawing room, whilst you go to attend to cooking or laundry in the kitchen, is to provide the said client with a play-pen, loaded with construction toys of one kind or another. Naturally you don’t “dump” them on your child, but show an interest and get involved before you take a break to do your own work. My wife and I provided one for our own children, and one of them was so perpetually absorbed by what he could do with the facility that the creative habit stuck, and he is now working in aircraft design.